A first-class office building, providing mission-critical facilities for tenants operating 24/7. The perfect destination for high-tech innovators. A Mission Critical Facility, 3500 Steeles Avenue East is one of only a few buildings in Canada that offers dual grid power supply. Wired Certified Platinum is the highest rating possible and confirms 3500 Steeles Avenue East as best in class across all features of connectivity that matter most to tenants: number and quality of internet service providers, redundancy and resiliency of telecom infrastructure, ease of installation and capacity to readily support new telecom services. The building can support current and future tenants with the most stringent technology requirements. Curved glass roof Atrium that provides natural light and warmth. 3500 Steeles Avenue East, one of an elite group of buildings receiving a Wired Certified Platinum rating. 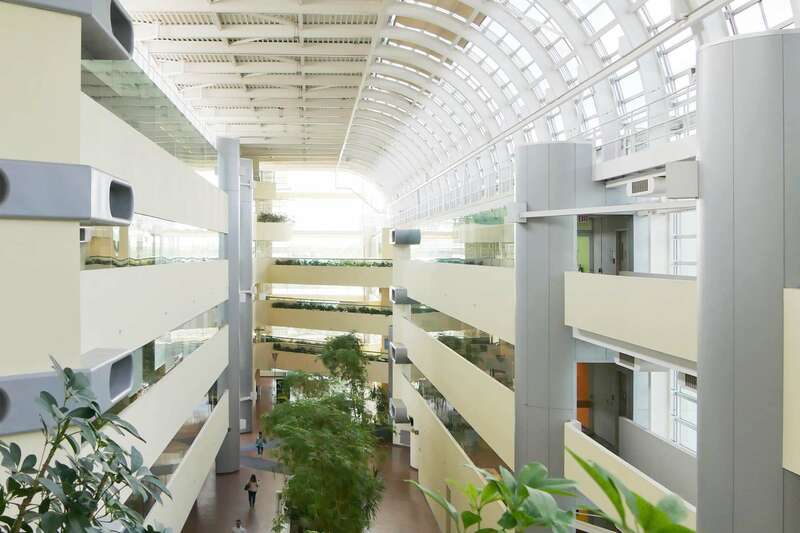 3500 Steeles Avenue East is approximately over 550,000 sq. ft. of rentable area. Four triangular shaped office towers and one rectangular shaped computer/office tower, all interconnected by a majestic 700 foot long glass roof atrium covering 16,000 sq. ft. offer tenants an unsurpassed level of natural light. The building’s exterior is comprised of a white metallic finish with grey reflective glass windows. The office towers are very efficiently laid out with approximately 20,000 sq. ft. per floor. The two southern buildings have five floors and the two northern buildings have six floors. The rectangular computer/office tower has approximately 70,000 sq. ft. per floor and is three storeys high. An interconnecting corridor arrangement with horizontal bridges on each floor, links the four triangular towers. Energy conservation controls the heating, lighting and air-conditioning. The complex is an excellent model of energy efficiency. 3500 Steeles is equivalent to 28 storeys, with approximately 550,000 of rentable square feet. The typical floorplate in 3500 Steeles ranges from 16,000 to 20,000 rentable square feet. Easy access via public transportation provided by the TTC and YRT/Viva. Viva provides a service for those people who commute from the area north of Steeles Avenue East; and Toronto Transit has regular east/west Steeles Avenue East services as well as north/south routes. The TTC also provides a rush-hour service in the area immediately surrounding the complex. Two bus loops are located on site; one is situated on Victoria Park Avenue, and the other on Esna Park Drive, both just north of 3500 Steeles Avenue East, accommodating buses on the north-south routes. For those that prefer to bike to work, there are several locations throughout the complex to park and lock bicycles. 3500 Steeles Avenue East is one of only a few buildings in Canada that offers dual grid power supply. This power is delivered via two separate and diverse feeds from two live generating grids - one from Niagara falls and the other from Pickering. The base building power has UPS and ATS to ensure there will be no power interruptions. In addition, the building has a shared substation that provides power exclusivity to the building at wholesale rates. 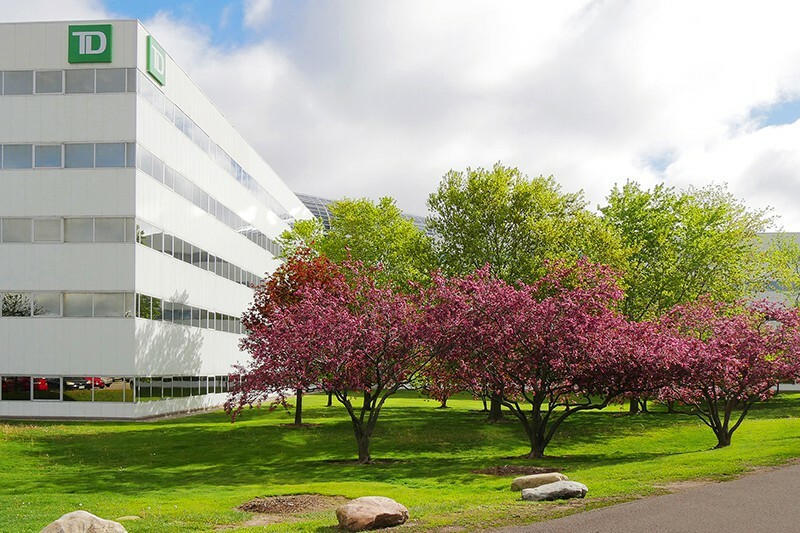 The unique design and high level of investment in this building provide for some unique capabilities that represent tremendous value for tenants looking for 24/7 operations with fully redundant power services. Two bus loops are located on the complex site; one is situated on Victoria Park Avenue, and the other on Esna Park Drive, both just north of 3500 Steeles Avenue East, accommodating buses on the north-south routes. Atrium Bistro is open from 7:00 a.m. until 2:00 p.m. Monday to Friday offering grill items, hot meals, pizza and speciality sandwiches, soup, etc. and BBQ on the patio every Wednesday from late Spring into early Fall – (weather permitting). Extended evening hours from 4:30 p.m. to 6:30 p.m. for grill items and soups. Liberty Gifts is a convenience store located on the main level Atrium open from 8:00 a.m. to 6:00 p.m. Monday to Friday. Convenience store offers a selection of packaged foods, wide variety of beverages and snacks, lottery tickets, greeting cards and dry cleaning service. Efficient air-conditioning and heating systems serve the needs of the occupants from equipment located in mechanical rooms that are strategically situated throughout the complex. Fresh air is drawn into the building, cleansed by high-efficiency filters and heated or cooled as required. The complex makes use of the thermal storage, permitting operation of the main chillers during off-peak electrical periods to pre-cool up to three quarters of a million gallons of stored, chilled water. The complex was designed with the emphasis on occupant safety. The entire complex is monitored on a 24 by a computer operated fire alarm system and monitored by our Security personnel 24/ 7 / 365. This computerized system ensures that in the event of a fire, alarms will sound throughout the entire complex. The system also triggers many different functions designed to contain the fire and ensure the safety of the tenants. 3500 Steeles currently offers 2 conference rooms with a maximum capacity of 30 people each. 3500 Steeles also offers a 120 person fixed seating theatre style auditorium. These rooms are equipped with upgraded AV availability. Security guards are on location 24 hours a day, and are available to provide “Safe Walk” services on request. The Security and Life Safety Control Centre is located on the second level at the west entrance to the complex monitored by our Security personnel 24/ 7 / 365 . The Centre is staffed 24 hours per day, 7 days a week, by fully trained security personnel who are in constant communications with emergency and maintenance staff throughout the complex. All security personnel are certified in first-aid and C.P.R. trained. 3500 Steeles is located across the street from a Goodlife Fitness Centre. This facility is equipped with many walking paths through the park-like settings. Tenant Service Line available 24 hours/day 7 days/week via phone. Canderel Management office and staff on site. 3500 Steeles offers surface parking which is located on the north and south side of the complex is accessible via both Victoria Park Avenue and Esna Park Drive (just north of Steeles Avenue East). There are approximately 2000 available parking stalls. Designed specifically to enhance customer service experience. Tenant Request – ANGUS Anywhere Systems® technology allows customization of service level requirements of 3500 Steeles, ensuring that tenant needs are effectively met 24 hours a day, 7 days a week!